The biggest name in San Diego's mayoral race so far is now off to a blazing start, racking up endorsements from influential city labor unions. Could Nathan Fletcher wind up ensuring himself at least a runoff-election spot? As a newly-minted Democrat, the former Republican assemblyman is starting to sell his credentials to organized labor. On Thursday, Fletcher was endorsed by the 850-member Firefighters Local 14, and 4,000-member Municipal Employees Assn., giving him an aura of potential front-runner status. Who Will Run for Mayor of San Diego? As San Diego Mayor Bob Filner prepares to leaves office, candidates are lining up to replace him in a special election. Gene Cubbison reports. Comprising white-collar and clerical workers, MEA is city government's largest union. Will more unions jump on his bandwagon? And to what extent will that impress voters? In the wake of Mayor Bob Filner's resignation, a couple of potential mayoral candidates have already emerged. NBC 7's Nicole Gonzales reports. "I think the voters are concerned about having a mayor that's going to restore faith and confidence in the office of mayor,” Fletcher told a news media scrum of reporters and cameras outside Fire Station 11 in Golden Hill. “I think the city workers need to know they'll have a mayor who will not embarrass them, will honor their service. 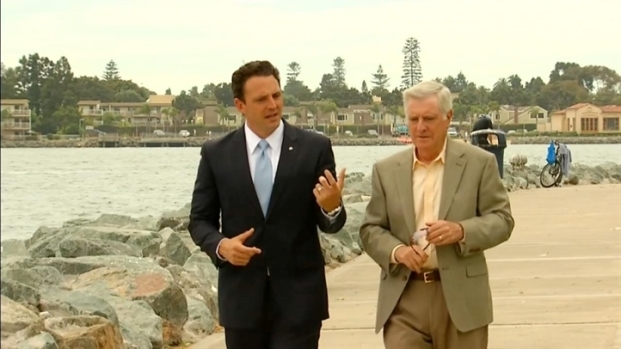 And then I think San Diegans are ready to move forward." Fletcher, the top corporate development executive at Qualcomm, is courting Democratic leaders with the premise that he can win with them. He’s told them, in practical terms, that he can raise $2 million dollars in two months' time -- and that he can appeal to both labor and business interests, as well as the electorate. "You know, I think people don't want to spend the next ninety days talking about the past ninety days,” Fletcher said at his Station 11 event. “I think they want to starting talking about where we want to go the in the future. And that's the type of campaign we're going to run." But there’s unease among the Democrats – especially old-school progressives and other labor groups -- over Fletcher's having joined the party recently, after a spell of political independence since leaving the GOP last year. Shedding his Republican skin during the mayoral primary, in which he was endorsed by the Police Officers Assn., didn’t get him into the runoff. GOP leaders scoff at Fletcher’s conversion, warning voters that he's just following Bob Filner's political playbook. "Look, these people (labor) are the groups that opposed pension reform, oppose managed competition,” says Ron Nehring, former chairman of the California Republican Party. “They oppose everything Jerry Sanders and the reform-minded City Council wanted in order to protect taxpayers and reduce costs. These are the groups that are lining up behind Nathan Fletcher today." And Nehring, in a Thursday interview with NBC 7, warned Democrats that Fletcher will tell them whatever he thinks they want to hear. Fletcher, asked about that issue during his news conference, addressed it this way: “"You know, in politics it's easy to stay in a position that you think is wrong because it's convenient, or because you don't want to be criticized. I think we need a mayor that's going to be honest. That's always going to look at new information, that's going to listen to people they may not have listened to before. And then be willing to admit when circumstances changed." For their part, the fire fighters have reconciled Fletcher's change of 'heart and mind' -- politically speaking. "He's moved on, like so many of us have,” said Local 145’s president, Frank De Clercq. “I don't think the Republican Party represented his values and what he believes. And we see many people doing that." If Democratic leadership harbors serious doubts about Fletcher’s ideological sincerity, it figures to need "viable" alternatives. Four other 'name' Democrats -- former Assemblywoman Lori Saldana, Council President Todd Gloria, and Councilmembers David Alvarez and Marti Emerald – are said to be thinking of running. How long can they put off joining the race – which has now attracted a field of 14 candidates, none of them a real household name? Will Fletcher’s fast start scare them off? Whatever their calculations, Team Fletcher seems to be sending his potential rivals an intimidating 'market signal'.